Venezuelan Refugees Face Violence And Closed Borders As They Try To Flee Over the weekend an angry mob attacked Venezuelan migrant camps in a Brazilian town near the border. Ecuador has declared a state of emergency, and closed its borders to those without passports. 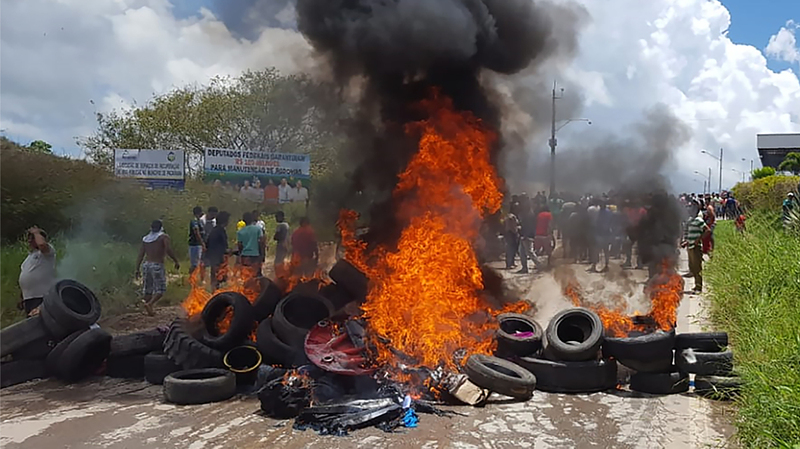 Residents of the Brazilian border town of Pacaraima burn tires and belongings of Venezuelan immigrants, after an attack on their makeshift camps. Venezuelan refugees continue to flee across the border by the thousands each day, and are increasingly facing protests and attacks in neighboring countries. Over the weekend mobs torched refugee camps in a border town of northern Brazil. As many as 1,200 Venezuelan migrants had to flee the Brazilian town of Pacaraima - in which recent makeshift camps had been set up - back across the border to their home country, according The New York Times. The town had been a main entry point for Venezuelans seeking refuge in Brazil. According to reports, an attack on a Brazilian merchant by Venezuelan criminals sparked the violence. Rev. Jesus Lopez Fernandez de Bobadilla, a Spanish priest in Pacaraima, told The Times the migration crisis is straining the resources of the town of 12,000. Still, Father de Bobadilla said, "Pacaraima is offering a truly shameful example of intense and violent xenophobia." Jose Ramon Gonzalez, National Relief Director at the Venezuelan Red Cross, told NPR his team is caring for the most vulnerable people in the country, and they are monitoring closely the health situation on the ground. He said people are traveling across the border for a fresh start, and new life. The United Nations says more than 7 percent - 2.3 million refugees – of Venezuela's population have fled to other countries, making it one of the largest mass migrations of people in Latin American history. U.N. humanitarian officials report that 1.3 million of those who fled were suffering from malnourishment. More than a million Venezuelan migrants have reportedly arrived in Colombia over the past 15 months, according to Reuters. Another 4,000 are reportedly crossing the border into Ecuador every day. The refugees' arrivals are inspiring protests and xenophobia in some communities. Hundreds of Ecuadoreans in the border town of Tulcan marched last week to demonstrate against the influx of migrants. "You can help five, 10 or 20 Venezuelans but you can't help ... 10,000," Jairo Pozo, an Ecuadorean business owner behind the protest, told The Guardian, arguing that the refugees are stealing jobs. In response to the mass inflow of refugees, Ecuador has begun closing its borders to people not carrying passports, a move Colombia has protested, saying vulnerable migrants will now be trapped on its side of the border. The refugees are fleeing a growing economic catastrophe in Venezuela, which has led to shortages of food and other basic necessities. Newsweek reports that some city officials have been walking off the job as the situation worsens, "As Maduro struggles to maintain control of the country, police and military officials have been abandoning their posts as their paychecks have stopped coming." NPR's Colin Dwyer reports runaway inflation topped 60,000 percent last weekend, and that the currency has lost so much value "it takes stacks of bills just to buy a roll of toilet paper." Dwyer reports that Venezuela's currency will now be pegged to the government's proposed cryptocurrency, the petro, in the process "devaluing Venezuela's physical currency by more than 95 percent and radically weakening its exchange rate." The government's economic policies will almost certainly force more people to flee across the border to communities that say they are unequipped to receive them. 27-year-old Daniel Luquez told The Guardian, "Getting here was tough, but I have to battle for my family." He said made his way on crutches 1,200 miles to the Ecuadorean border, in a "desperate effort to earn money to cover his daughter's cancer treatment," he told the paper. Luquez, whose leg was amputated after a car accident, explained that after migrating first to Colombia, he was attacked by residents there. He then attempted the journey to Ecuador. Last week the Pentagon said it is preparing to dispatch a hospital ship to Colombia to assist with the refugee crisis. The ship will depart from Norfolk, Virginia, and arrive in the fall. "It is absolutely a humanitarian mission," Defense Secretary James Mattis said. That may not be soon enough to help countries deal with the volume of refugees. Ecuador declared a state of emergency earlier this month. In Brazil, Col. Hilel Zanatta, who heads the military task force that is managing the refugee process in Pacaraima, told The New York Times the border there had reopened Sunday after what he called "a very tense day."